Our promise: to do everything in our power to meet your schedule while maintaining the highest standards for quality, reliability and safety. In our 30 years of experience, we have seen many cold storage construction companies come and go. One of the primary reasons for this is poor construction management. Over the years, we have learned the secrets of maximizing productivity in the field and minimizing conflict. Frequent personal contact with contractors and regular on-site inspections help to ensure schedule compliance. When full-time site supervision is required, we empower our superintendents with full decision-making authority. Crucial time is saved by making decisions on the spot. Our promise: to do everything in our power to meet your schedule while maintaining the highest standards for quality, reliability and safety. Regular meetings are held to discuss the progress of each job. Delays in the construction schedule are anticipated and corrected before they occur. Material and equipment arrive at the site exactly when they are needed. Manpower is adjusted to stay on schedule. Our field superintendents forward daily reports to their project managers to keep them fully informed on job progress. Contingency plans are developed to deal with anything that could adversely affect the schedule. Our goal is not only to meet your schedule but to beat it. 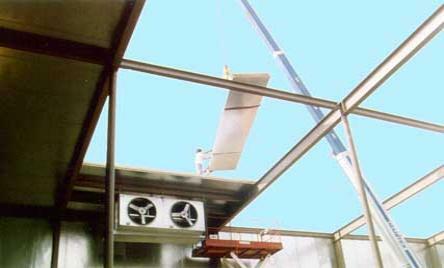 We use only employees and subcontractors skilled in the cold storage field. Some of our installers have worked together for over thirty years. This experience allows them to draw on a wealth of experience to solve any problems that arise. They are firmly committed to quality and it shows in their work. When construction is completed, our project team will program automated functions and fully test all systems. Your personnel will be trained in operation and maintenance procedures, as required. Regular field safety meetings are held to prevent accidents. Our personnel comply with all applicable safety regulations and use the latest in safety equipment. They realize that safety is critical to the timely completion of the project.